We’ll be kicking things off with a set from 12:00-12:45pm, and there’s more kid-friendly music and activities throughout the day. 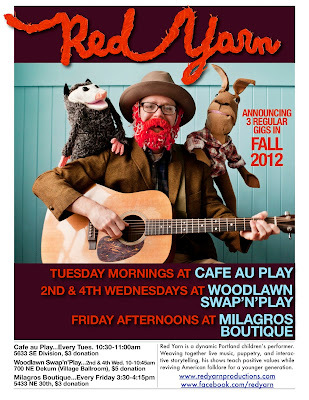 “Bob Rabbit on Mr. Man’s Farm”–Red Yarn’s new library program! Bob Rabbit must sneak onto Mr. Man’s farm each night to scrounge his vegetable dinner. But he has company–a sly fox, looking for another kind of dinner! Can Bob use his wits to escape the farmer’s traps and protect the friendly fowl from predators? This engaging show features classic folk songs and teaches children about the food chain and life on a farm. http://redyarnproductions.com/wp-content/uploads/2016/04/bright-red-logo-for-web1.jpg 0 0 Red Yarn http://redyarnproductions.com/wp-content/uploads/2016/04/bright-red-logo-for-web1.jpg Red Yarn2012-09-04 14:13:002012-09-04 14:13:00Fall shows!